Oh, how I loved them in my glory days. Unfortunately, time has gotten the best of me and I'm not a big fan anymore, but I also don't care for the snow the same way I did as I was younger either. I feel incredibly blessed to live in a climate that offers up four seasons, but I assure you I hold a completely different opinion when I'm walking my children to school during a blizzard. You can also often find me asking myself over and over why I live where the air hurts my face from mid-November to March. As a kid, there was nothing better than snow days; we lived for them. My Grandma used to save her cracked plastic shoe boxes and rectangular, orange cheese boxes over the course of the year so we could build and construct a retaining wall or snow fort come winter. It was so important to be prepared. If you didn't have proper shelter, especially during a snowball fight, you were as good as toast and might as well have raised that white flag of surrender once that first big snowfall blanketed the ground. We often kept it a clean fight until some neighbourhood kids found out our friend packed yellow snow into those cold, spherical orbs. In retaliation, they hid pebbles and chunks of gravel in the snow and made it really unsafe. My brother got hit just below his eye once and it left a dent, which I'm pretty sure is there to this day. After that, the mothers united and declared that dirty snowballs had to cease or snowball fights would be banned altogether. In this day and age, it seems snowball fights are banned everywhere. Now that I'm a mother, I have complete understanding and appreciation, but that child inside of me can't help but feel for bad for those kids that will never feel the sensation of a smashed snowball dripping down the back of their head and straight into their parkas. AGAIN. I'M A MOTHER. I should know better. I've created these Dirty Snowball cookies (see recipe below) using Burnbrae Farms Naturegg Simply Egg Whites to commemorate the glory days. These cookies hold another nostalgic flair for me as they have the flavour components of the popular chocolate, coconut, and almond candy bar I enjoy to this day. The carton of egg whites make it so easy for my kids to help out and guarantees zero shells in our finished product. 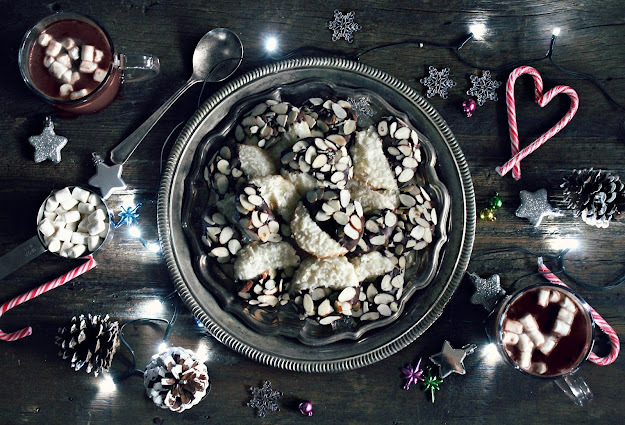 (Because the only thing that should provide crunch and texture in these cookies are the almonds). Although these delectable cookies won't physically harm you, they're perhaps not that safe for your waistline if you eat too many, but I dare you to eat just one. Ah heck. The holiday season is just around the corner, friends. Indulge. Just watch your back for those snowballs. I may be slower, but I still have very good aim. 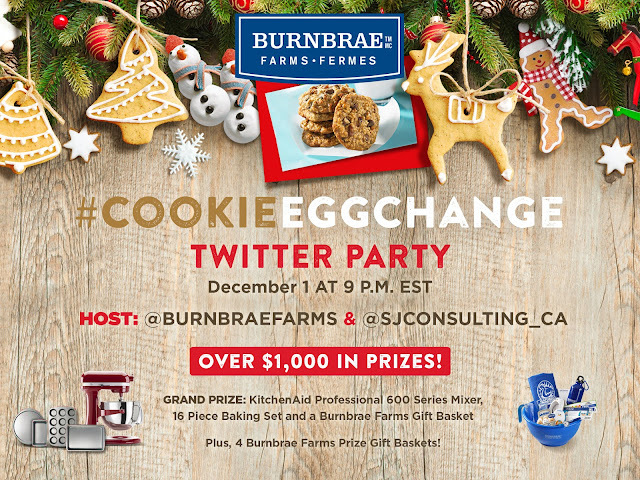 Be sure to join Burnbrae Farms, SJ Consulting and yours truly for a #CookieEggchange Twitter Party on December 1st at 9pm for your chance to win some great prizes! Stay connected with Burnbrae Farms on Twitter, Facebook, and Pinterest! *To make these cookies gluten-free, substitute the all purpose flour with a gluten-free flour blend like Bob's Red Mill Gluten-free One to One Baking Flour or Cup4Cup Gluten-free Flour. Preheat oven to 325 degrees F. Prepare a large cookie sheet by lining with parchment paper or a silicone mat. In a large mixing bowl, stir together coconut, sugar, flour and salt. Using a fork, stir in egg whites and vanilla or almond extract, if using. Mix well to incorporate. Using a scoop with a retractable mechanism, scoop out dough and place on prepared cookie sheet two inches apart. Using the back of a spoon, slightly flatten coconut mixture. This will help with dipping the cookies once they are baked. Bake cookies for 18-20 minutes. The outer edges will become golden brown when they are done. Remove from oven and allow to cool for a couple minutes before transferring cookies to a wire rack to cool completely. Line a chilled baking sheet with a piece of parchment paper; set aside. In a heat-safe container, melt chocolate and coconut oil together in the microwave using 30 second intervals, stirring between each one. Once chocolate is a very smooth consistency, dip half the cookie into chocolate, allowing excess to drip off. Immediately sprinkle with embellishment of your choice - I used slivered almonds, but you can use any other nuts or sprinkles. Arrange cookies on tray and refrigerate to allow chocolate to set. Once set, they do not have to be refrigerated. Cookies will stay fresh for one week in an airtight container. Disclosure: I am participating in the Burnbrae Farms campaign managed by SJ Consulting. I received compensation for my participation. All opinions and comments are 100% my own. I will never endorse anything I don't use or believe in myself and I will always give my honest opinion regardless. Kids are the worst sometimes! Ha! We would have been great friends! Every time I come to your site I ask myself why I never thought to do that! I LOVE Almond Joy candy bars and I think this is what they would be if they were in cookie form!! I love how easy these cookie are! It's like 6 easy ingreds. You've made my night but can we not talk about Christmas or snow yet???? LOLS....great name for a cookie!! I actually can't wait to try these out! They look almost too easy! 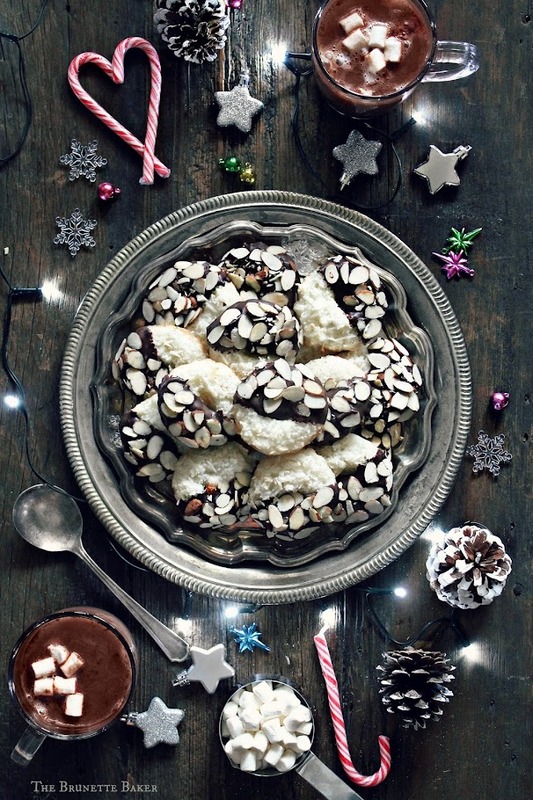 I've just bookmarked these cookies for my holiday baking along with your Caramel Nut Tart! Your blog is simply gorgeous and I'm sure your recipes are as well. Thank you! I will be subscribing to receive all your posts!